The Control Tower sits in the centre of the Museum grounds. It’s the original building, used by the bomber crews in World War Two and accurately restored for visitors to experience what life will have been like at the time. On certain days of the week, visitors will also be drawn by the chatter of Morse Code in the air. Following the sounds will take you to a small room on the corner of the museum, where you will find a fascinating array of radio equipment. This is the Museum’s radio room. Lovingly restored by volunteers, the banks of period radio equipment are in full working order and this skill and dedication allows the Museum to be in contact with radio enthusiasts across the world. The radio that many visitors find fascinating is the recreation SOE suitcase radio built by Ken Sanderson. It is a 100% accurate, fully working reproduction of the crystal radio sets smuggled into France by the evocatively named Special Operations Executive in World War Two. Disguised as a suitcase, these radios could be set up in minutes by agents to transmit vital intelligence back to the UK and were pivotal in enabling supplies to be delivered to the French resistance. Recently on the 9th May, the 75th anniversary of the very first transmission from Nazi occupied France was commemorated with an event across Europe. Listen to this short podcast as Ken talks to Vale Radio’s Dougie Weake about recreating this remarkable event that few people will have heard of. The suitcase radio equipment would have effectively been a death sentence for anyone captured in possession of such an incriminating device and you can only imagine at the bravery required by men and women operating in German occupied France. There’s something quite evocative about the fluctuating bleep of morse code playing over the speakers, a message being sent by another radio station, somewhere in Europe or even beyond. Ken and the other radio room experts always enjoy explaining the technology to visitors who’ve been attracted by the chatter of the communications. The radio room experts are generally on hand on Wednesdays and Saturdays, so if you’re visiting the Museum, call by the control tower and listen in to some of the radio stations they’ll be talking to that day. Thanks to Dougie Weake and the team at Vale Radio for making the Poscast available. Vale Radio is a new DAB radio station for the Vale of York, using today’s digital technology! Pleased to see radios in such good operating condition considering their age well done! As I hold an amateur radio licence, the friendly team in the radio room kindly allowed me to operate their transmitters for half an hour. It was a great privilege. This is a fascinating part of a wonderful museum. Long may it flourish. Filters were great,working V bombers on the deck as far away as Darwin Goose bay,Offat etc. keep up the good work gents I we’d love to visit your site. We came for a visit Wednesday 17th April 2019 and was very happy to see the radio room. My 4 year old boy is still talking about it. 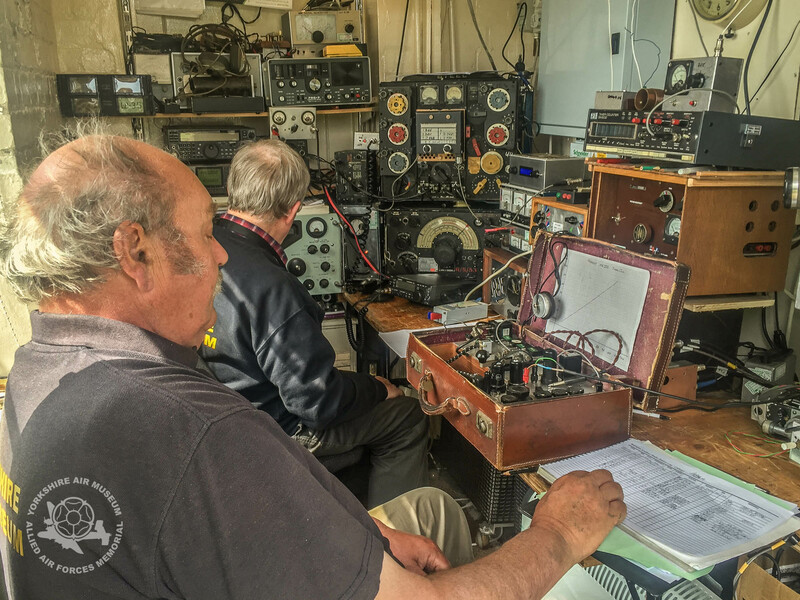 Most grateful to be shown the Direction Finding circuits on the R1155/T1154 radio in action in this fantastic shack. We homed in on the Radio 4 transmitter. I don’t think we’ll see that again any time soon and can’t thank you enough.